The first time I went to Iceland, Finboggi Gudmundsson took me to the farm where my great great grandfather and my great grandfather lived and worked before they left for Amerika. It was one of those fine Icelandic days with no wind off the North Sea, the sky was cloudless, the sun warm. It was the perfect day for making hay and, when we reached the farm, the farmer and his wife were in the hay field. It was the greatest compliment they could give that they stopped haymaking long enough to serve us coffee and cake and have a brief conversation. I walked the beach were my great grandfather Ketill walked, sat on the stone wall where he used to sit. Then we were away and the farmer and his wife were back to the field making the precious hay for their sheep and cows. In 1862 when A. J. Symington goes to Iceland, he stops at Thingvalla. They are treated well by the priest, Mr. S. D. Beck (are any of you descendants of his?). One crop. Upon it life depended. 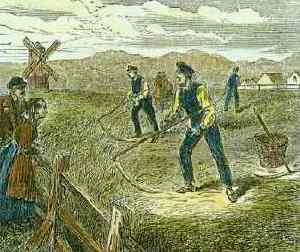 Everyone turned to making hay for this was not a grain economy. The Icelandic population lived on hay for hay fed their sheep and cows and those two beasts provided milk, meat and wool. The rule was simple. Harvest enough hay to keep your animals through the winter or you will die of hunger. Those who lived close to the ocean might supplement the hay with seaweed but it was a supplement, not a staple. With every stroke of the short scythe, with every pull of the rake, the haymakers could think that will be another mouthful of skyr, a drink of whey, a piece of smoked meat this winter. It was a direct equation your ancestors all understood.